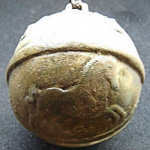 The bell pictured here, found in Germany, has leaping or rearing horses on either side of the throat (slit) and lion's heads circling the shank. 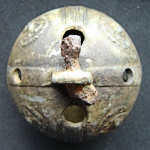 A corroded iron bell pin is still in place on the shank. 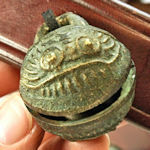 Photos: Animal bells. Copyright by Titus Jonas, all rights reserved. 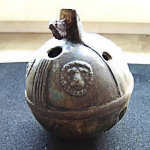 We often receive inquiries about collectible brass bells similar to those shown. 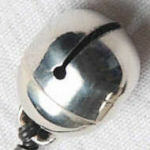 They are often made in India, China, and other Asian countries. 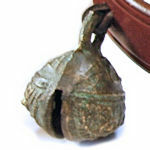 These bells are typically intended for use as gifts and souvenirs, not as horse bells. 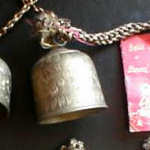 First row, left to right: One bell in a string of "Bells of Sarna", assorted bells with holiday inscriptions, a small "dance bell" often sewn onto clothing, elephant bells. Second row: Tiger bells from Nepal, Tibet, India, and nearby countries. 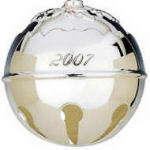 Some companies offer sterling silver, silver-plated, or nickel silver collectible bells. 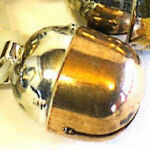 Although these bells look similar to horse bells, they are intended for display only. 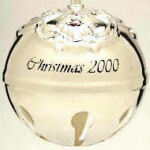 Reed and Barton, Gorham, Towle, Leonard, Hallmark, and Wallace are company names to research. 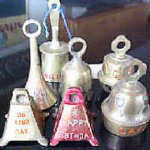 Left to right: Collectible bells from Wallace, Gorham, and Reed & Barton. Falconer's bells are small bells that are attached to the legs of captive hawks, eagles, falcons and other raptors used for hunting. 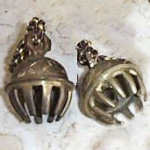 Some horse bells are similar in shape to falconer's bells, but they are much too large and heavy to be worn by birds. 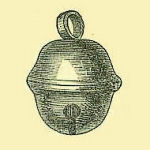 Left to right: Falconer's bell from Pakistan; bell made by Ricardo Velarde, USA; bell from the Book of Days by Robert Chambers, 1869. 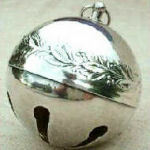 (1) Don Livingston, sleigh bell collector. Personal communication, 2 April 2010.